"Its not important that the people of Jharia are living on fire. Whats important is that they are living on coal." Jharia Coal Field is one of the most important coal mines in India and one of the largest in Asia. Once a treasure trove of high-quality coking coal, uncontrollable coal fires have turned the mine into a slow-burning inferno. Underground mining first started in the area about a hundred years ago and was done very unscientifically and unsustainably. When the mines were nationalized and a public sector company Bharat Coking Coal Limited (BCCL) took over, they started to dig huge opencast mines to get to seams of coal near the surface – a cheaper way of mining. Once used, these enormous coal pits were then abandoned, leaving the coal seams exposed to the atmosphere. This caused the seams to ignite. Once alight, these fires spread across, and entered the town. India accounts for the world's greatest concentration of coal fires. Rising surface temperatures, and toxic by-products in groundwater, soil and air have turned the densely populated Jharia coal fields into wastelands. About fourteen million ton of high quality coal is locked up in fire underneath. 595 sites have been indentified where fire and subsidence exists. The ground underneath can collapse anytime, taking with it the lives on it. 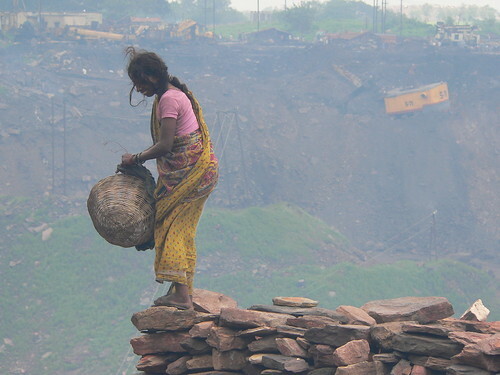 Pilfering coal is a major source of livelyhood, almost a industry in Jharia. Most people collect coal illegally for less than a dollar a day. Children as young as 10 years of age are a part of this coal trade, having to give up on their rights to education and a safe life in face of hunger and starvation. Its almost ironical, that the people, who live on land so rich with coal and other minerals, are the once fated to be the most poor in the world! Ill health adds to the sense of despair in the town. Pollution invades everything – air, water and land. Smoke from the fires contains poisonous gases including carbon monoxide, carbon dioxide, sulphur dioxide and nitrogen oxide. These fumes, along with fine coal dust from the fires, cause several lung and skin diseases. There is a very strong belief amongst the people that these fires can be quenched, but is being used as an excuse instead to scare and displace the populace so that they can extract the coal below. People are willing to loose their lives to fire, but not give up on their land. My film will revolve around a thirty year old lady who collects coal for a living, and a fifty year old man who is raging a war against the government to save his town from inhilation. Gayitri Devi lives in a one-room house in one of the active fire zones called Bokapahadi. The floor of her house has a huge crack running through it, and fumes from underneath fill the house. She pilfers coal for a living. The film is the human story of coal, the story of a town that is dependant on coal for its survival, yet ironically, its same coal that will eventually lead to their annihilation. The story will be a parallel narration of the two main characters – Gayitri Devi and Ashok Agarwal – Their lives, endeavors and aspirations. Both the character have a common enemy – Coal. While Devi's struggle with coal is direct – as she struggles to save our house and family from the fire raging below, as she pilfers coal for the survival of her family, Agarwal is fighting coal in the court. He has filled a petition in the Supreme court for the proper rehabilitation of Jharia, and for quenching the fire beneath. This film will be an observational journey of my characters over a period, to give the audience a glimpse on the impact of coal on their lives, family, health, attitude, environment, livelihood etc. How they are being haunted by the same commodity that we think has taken our civilization forward in to the new era of development. What the film maker is really trying to ask is – Is this what we mean by development? Is this what we bargained for? Is it fair, that the people who live on the most mineral rich land, remain the poorest of the lot? Jharkhand Org is launching shortly the public website for all districts of Jharkhand State. You may now check out the work in progress on following links.